Third graders from Poinciana Park Elementary School during their Sunroom Poetry class. Third grader Danyelle Daniels preparing for her poetry reading. Poetry Teacher Laurel Nakanishi and third graders from Poinciana Park Elementary School. Elementary students from three Liberty City schools spent the last two months meeting once a week to write poetry, and some of it has ended up in some unusual places. Like gas stations. And buses. “Poetry asks kids to come up with innovative ideas. It encourages them to think outside the box instead of asking them to zero in on a definition or answer to a test question,” said Laurel Nakanishi, teacher and coordinator of the program that added poetry to the kids’ curriculum. The Sunroom Poetry program started at Orchard Villa Elementary in Liberty City. It is now part of the curriculum for a little more than 100 third and fourth graders in the neighborhood. Nine-year-old Otis Guyton became a first-time poetry student this spring. Poems written by third graders from Poinciana Park Elementary School. “My favorite part of the class is when we get to write the [poems] and talk about our feelings and talk about the things we like about our neighborhood,” said Guyton. Guyton attends Poinciana Park Elementary. He and nine other third graders recently learned how to write poetry using similes and metaphors. But Nakanishi says poetry is more than just learning how to write for the students. “Having a venue to express their emotions--I feel like that’s not always available to them, and so through poetry they really have a chance to feel heard and to articulate what they’re actually feeling,” she said. Nakanishi, a native of Hawaii, received her master’s in fine arts from the University of Montana. She has taught poetry to children in Montana, Nicaragua and Hawaii. She made South Florida one of her teaching destinations two and a half years ago. When Nakanishi arrived in Miami, she proposed the kids’ program to the directors of the O, Miami Poetry Festival, who didn’t hesitate to move forward. “It was so sort of natural for us to fund a project working with Laurel,” said Melody Santiago Cummings, the operations director of O, Miami. A transit bus covered with poems from elementary school kids. The program, Santiago Cummings says, took the name of “sunroom” because of the Florida sun. Contributions from the Children’s Trust and the Knight Foundation helped make it possible. For Scott Cunningham, director of O, Miami, the program also serves as a channel to show some people a side of Miami they may not know about. In her eight years of teaching poetry, Nakanishi has noticed a difference on what her students from Liberty City write about. A poem displayed on a pump at a Tom Thumb gas station. 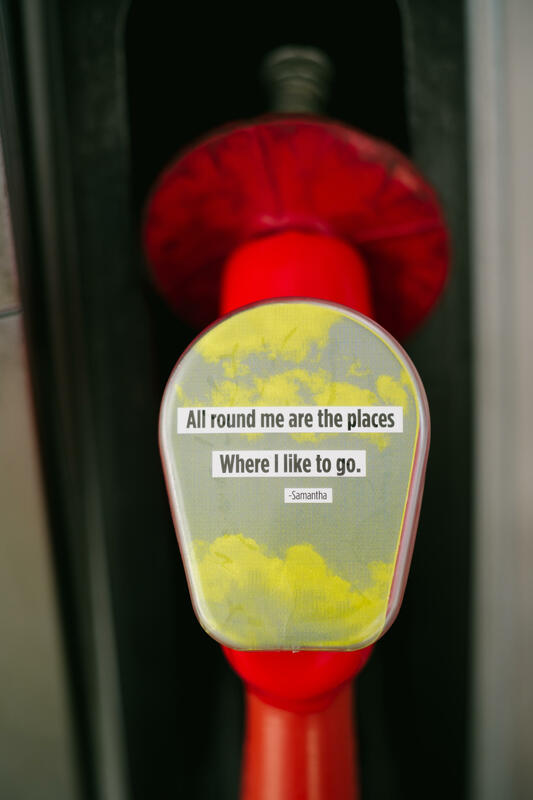 The kids’ poems--in English, Spanish and Creole--are displayed on the pumps at Tom Thumb gas stations around the county and at check-out lanes of the Sabor Tropical grocery stores in Miami’s Mimo District. 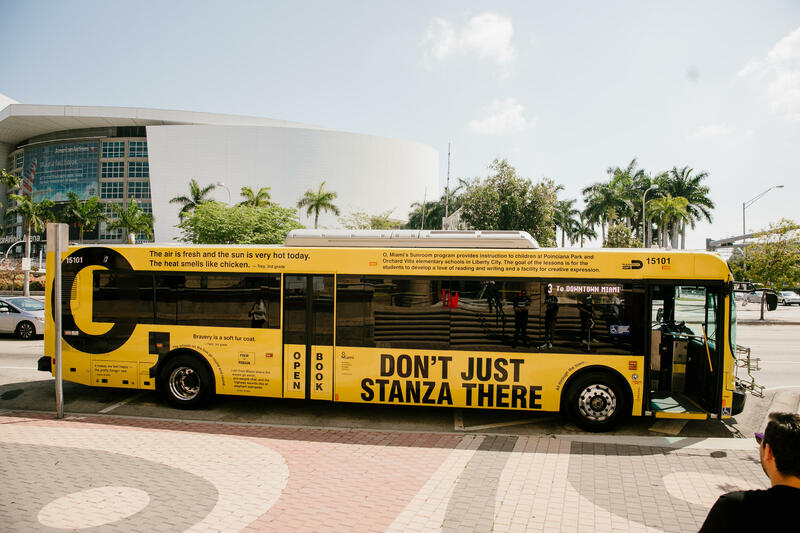 Last month, Miami-Dade Transit also unveiled a yellow city bus covered with the kids’ poems. The program concluded last week with a poetry reading. The student poets will meet again next year in time for National Poetry month. Miami City Ballet's Patricia Delgado reflects on almost 17 seasons with the company, and considers what's next. Patricia Delgado was 11 years old the first time she walked into the Miami City Ballet studios to take class. Her sister Jeanette was nine. Dance Now! Miami’s latest dance piece is a direct response to President Donald Trump. “Bridges Not Walls” was conceived during the presidential race when the then-presidential candidate Trump repeatedly declared that he would build a wall along the U.S.-Mexico border. “When Donald Trump came up and made those comments about immigrants, specifically coming from Mexico, we were at that time in the process of creating a collaboration with a Mexican [dance] company and so we thought that that was the moment to respond,” said Dance Now Co-Director Diego Salterini. Michael Brun grew up in Port-au-Prince, Haiti. As a kid, he remembers the pulsing and intoxicating rhythms that washed over the neighborhood every weekend in the form of rara bands--musicians beating drums, blowing handmade horns, clapping and singing through the streets.